A collection of Transmogrification Kits actually worn in-game by my Blood Elf Rogue. Outfits are listed from most recent to least recent. Items that are no longer obtainable are marked with an asterisk (*). Cap’n Crackers has to be Cap’n Crackers because there was already a pirate parrot pet named “Crackers” who would come sit on your shoulder when you /whistle at him. Crackers was originally the companion of Fleet Admiral Tethys. After Crackers defected to the Shadowblade during the Legionfall segment of the Rogue Order Hall campaign, Tethys replaced him with a monkey. As awesome as the shoulders for the Antorus Rogue Tier set look, I had to trade them out for something a little smaller for this kit. They were too big for Crackers to perch on comfortably — though he’d sit on my shoulder when I first /whistled at him, as soon as I started moving, he’d start hovering over my head and would only come back to sitting on my shoulder if I sat down. This set has so many fabulous little details — and the hat was a Must Have! This ensemble, the Rogue PVP counterpart to the Sunwell raid set, is the outfit worn by Vereesa Windrunner. A silly outfit for the Midsummer Fire Festival. Because there isn’t much in the way of either gilding or solid bright yellow in leather, leather was the most difficult armor type to make an outfit to wear with this holiday hat and shoulders. Dark with gilded accents seemed like the best way to go. Although my Rogue is limited to using daggers or swords, a Monk ought to use an utterly simple fist weapon such as these classic brass knuckles with this kit. Shortly after Transmogrification debuted, I participated in an Olympics-themed Transmogrification contest hosted by JD Kenada of Amateur Azerothian. Each contestant was assigned a faction to represent, though they only had to use the colors & thematic motifs of that faction in their first outfit, a kit for their flag-bearer in the opening parade of nationsfactions. I got Silvermoon, and designed a kit very much like this for my flag-bearer/torch runner. I’ve made a few outfits that were very similar to this for Kelisanna in the past, but with the most recent Winter Olympics fresh in memory, I thought it an opportune moment to make this particular variation on the theme. The black tint of the upgraded appearance of the Outlaw Artifact swords or the base red tint of the Mage Tower Challenge rapiers would also be fabulous with this outfit. Between the chestpiece from Draenor and the boots from the Broken Isles, this isn’t a kit that a low-level Pet Battling alt could wear. It’s quite nice for a high-level alt who is finishing out their leveling using Pet Battles, though. Fortunately, the place where Kelisanna had left off in the Sholazar Basin questline when she was leveling from 70 to 80 was right at the breadcrumb to start the chain leading to the croc-surfing quest. I just had to make a kit pairing the holiday sweater with these pants. And, of course, these fun holiday daggers must be used with the holiday sweater, too. This sword requires Shattered Sun-Revered reputation not only to purchase but also to use for Transmogrification. Fortunately, clearing Heroic Magister’s Terrace isn’t nearly as difficult or time-consuming now as it was back in the day. If you don’t even want to do that, though, the sword “Alimony“, from a darkly comic pirate quest chain in Thousand Needles, is the same model without the red enamel on the blade. I originally designed this attempt at a Tracer Transmogrification kit in honor of the official launch of Overwatch. The idea was primarily inspired by the slight stylistic similarity between the Spireflame chestpiece and Tracer’s jacket & chronomodulator device. I decided that these brightly coloured pants were the best choice to mimic Tracer’s brightly coloured leggings, even though they’re the wrong bright colour. I thought the Goat Hide shoes were the best style match for Tracer’s sneakers, but they’re also the wrong colour. WTB this style of shoes in white, please! I didn’t make the kit at the time partly because I couldn’t find a really good match for Tracer’s shades. It occurred to me, though, that the Bronze-Tinted Sunglasses would work quite nicely for that, so I needed to make the outfit before the 13th Anniversary event ended! Who better than Kelisanna “The Fabulous” to model a leather kit to wear with these fabulous shades? Though she’s not opposed to wearing an entire brightly-colored outfit, when there’s a specific brightly-colored item that she wants to be the focus of the outfit, she prefers to keep the rest of the ensemble darker and more subtly embellished. I’m not too fond of the pants that are in the set with this chestpiece — but these pants look great with it! I’ve long thought that the Mantid-styled daggers from Pandaria would look great with the Sunreaver tabard. I didn’t get around to doing the Argent Tournament with my Rogue until just recently, though. Some messages should not be transmitted magically and must still be carried by hand from the sender to the recipient. These elegant, beautiful daggers wanted an elegant, sleek kit to go with them. Admittedly, the color is not particularly suited for sneaking around at night — rather, imagine her standing unobtrusively just within earshot of Lor’themar Theron, Grand Magister Rommath, or Halduron Brightwing at an elite Silvermoon sociopolitical function. Not an attempt to replicate any one Jedi costume specifically, of course, just an attempt to capture the general aesthetic of Jedi apparel. Maybe a little bit of Leia and Padme in their Action Girl clothes, too. The shoulders, hat, and belt I’d chosen to go with the blue & brown version of this chestpiece work equally well with the green & brown version, so then it was just a matter of finding pieces for the other slots. The combination of medium and dark blues and maroons shading to browns in this chestpiece and pants really appealed to me. I wanted to do a daggers kit for a change, so I set up Kelisanna’s Subtlety spec. Subtlety was her specialization of choice right up until the announcement that Combat would be reworked & renamed into Outlaw; the idea of being a spy or a sneaky thief who only kills when necessary & unavoidable appeals to me more than being an outright Assassin does. a “Girl Genius” Hallow’s End Costume for my Mage way back in 2009. Having done a kit with the one Stylin’ leather hat, now I needed to do a kit with the other. This hat and chestpiece are an obvious combination, perfect for when one’s Rogueish purpose for being on the prowl is to break as many hearts as possible. The red stripes on the pants do detract from the effect, but at least they’re not very visible in a straight-on front or back view. A very classic look for a Blood Elf Rogue. There are so many good piratey swords that aren’t the Dreadblades that I was having trouble choosing which one to use next. So instead of doing something piratey, I decided to build an outfit around this combination of shoulders & chestpiece. The rich brown Overgrowth Cutter variation is my favorite color of this particular style of Warlords quest reward leather, and I’d previously noticed how nicely these shoulders matched it. During Warlords, I concluded that the Shadowmoon Cowl was my favorite hood style so far, and I wished that it were available in brown or black leather. This Legion leather hood matches the style of the Shadowmoon Cowl pretty closely, and it is available in both brown and black. Hurrah! I’ve specified the bracers because these gloves are so short on the wrist that they need the tiniest possible bracers for the bracers not to show. Oh, it is a lovely thing to be a Pirate Queen! This rather formal outfit will be just the first of many pirate-themed kits inspired by the Outlaw Rogue Artifact weapon, the Dreadblades Fate & Fortune. Although the outfit looks nice without shoulders, it somehow didn’t feel quite right for an Admiral to not have epaulets. The Light Drinker set is the gear that a Rogue is shown wearing on the new character selection screen. It is obtained in-game from the Warlords Garrison Salvage Yard. Kelisanna is also wearing the Bloody Bandanna. Many of the Wrath PvP shoulder designs are quite nice. 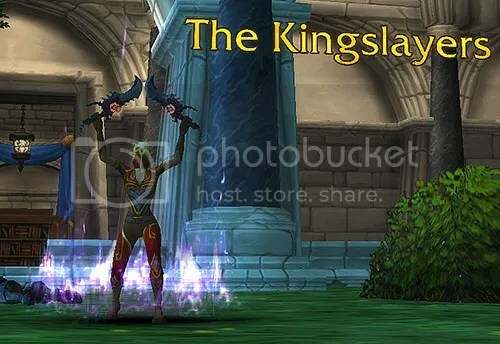 Fortunately for the PvP-averse, such as myself, the various currency redesigns that have occurred in the patches and expansions since then have resulted in those items now being available for gold. Although the Combat Rogue Artifact weapon is a pair of swords, Kelisanna has not yet been to the Broken Isles, and her best weapon is still a dagger. I’ve put her dagger in her off-hand for this kit, though, because the Blade of the Prime is such a big honking Final Fantasy-esque weapon that having it in her off hand, with the smaller dagger in her main hand, seemed terribly improperly balanced. This kit owes a great deal to an outfit contributed by Zhau@Hellfire-EU to my “These Boots were Made for Mogging” event three years ago. Zhau’s idea was better than my own designs! The bottom half of this kit is a collection of Outland quest rewards; alas, the leather chestpiece and belt worn by the Farstrider NPCs are not available for players. The chestpiece and shoulders I’ve chosen have accent stripes that pick up on the blue-green color, and if the brown isn’t quite right to match the pants, at least they coordinate well with each other. When this sword fell out of a Salvage Yard box, I almost immediately wanted to pair it with this lovely Cataclysm-era cloak. I’d been wanting to use this cloak in a kit for some time, but there didn’t seem much to pair it with beyond the obvious similarly-colored Replica Vestments of the Virtuous or Lawbringer Armor. The Razorcrystal Blade is an agility sword, so I decided that my Rogue should get it because it would actually be useful to her. She also happened to have this nicely matching dagger, and these coordinating bracers. The shoulders from the BC recolor of Druid T1 were a pretty natural choice. What surprised me, though, was that I also wanted the pants from that set to bring in more of the light green from the cloak. Warlords brought us a few more options for maroon leather with the stage 1 Supple chestpiece and pants. This kit is an expression of my fervent, yet likely never-to-be-fulfilled wish that High Elves would become a playable race for the Alliance. Sometime during the first half of 2015, I found a pair of Rhinestone Sunglasses on the AH for the surprisingly reasonable price of 500 gold. There’s not much in the way of pink in leather; only the maroon Bard’s set and the mauve Bonechewer set come even close. After contemplating those options, I decided that it would be better just to let the Rhinestone Sunglasses sparkle against a background of sleek black. We all know that the Exodar is a disco (right? ), but Sin’dorei are not exactly welcome there, so I boogied down in the Shattrath Residential District instead. This kit was so dark and sneaky-looking that it just didn’t feel complete without the hooded mask. The shirt is an essential component of this outfit because it fills in a gap between the sleeves and the gloves. The Bandit Belt would be a suitable replacement for the Ruffian Belt. Why, yes, I did do Klaxxi rep with my Rogue just so that I could have both styles of Mantid trophy dagger to use in this kit. The Subtelty questline raises a few intriguing questions, chiefly about our prime informant, Val’zuun — what’s his story? why is he helping us? what does his presence in Dalaran say about the security of the city? I’d hope to learn a little more about Garona in the Assassination questline, so I was a bit disappointed there. Overall, though, I found the Assassination questline to be the most interesting of the three. Being Horde in Alliance territory, even with the phasing so that there were only hostile NPCs present, no hostile players, made it feel quite tense. All the sneaking around a foreign city swarming with guards reminded me of what little I’ve personally experienced — and what I’ve read many complaints about — in Suramar City. I kept getting caught by the detail that the guards who could see through stealth didn’t have detection limit circles around them, the way I’ve gotten used to seeing in most relatively recent content. I’d get revealed, and if Vanish wasn’t up, I was toast. Before Garona and I got to the city, there was that town in an Alliance lowbie zone that, from what I remember of playing through that zone long long ago in pre-Cataclysm days, seems to have been horribly betrayed by those who were once its protectors. The presence of Winter Veil decorations made it feel particularly creepy. What is the fallout from what happened there? It seems like more people than just the Rogues should eventually know about it — but this is another situation where even though high-level players really ought to see the town changed, the town won’t change, because of how integral it is to the lowbie leveling experience. 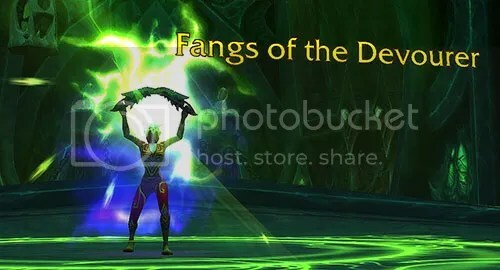 Also, where was that one Priest NPC who is in the same zone for other classes’ Artifact questlines when all this was going down? Shouldn’t he have been there, in the town, stopping that, rather than elsewhere in the zone, fretting about something else? Or did he not arrive in the zone until after the events in the town were over? I did both of these questlines as Outlaw; I didn’t particularly feel like setting up action bars and choosing talents. I’ll probably eventually set up at least one of the other specs, though, for when I want to do Rogue Mogs that use daggers.